Here's a recap of my personal favourite joints that I usually take my friends to or go to when I feel like having K-BBQ. These places are not the cheapest but they are at the average price zone in which you get "better" service like they will cook it for you, or at least half way through rather than you start and end on your own...RAWr. This is quite an important point to consider because not everyone knows how to BBQ right, right? and you don't want to be hangry doing it. 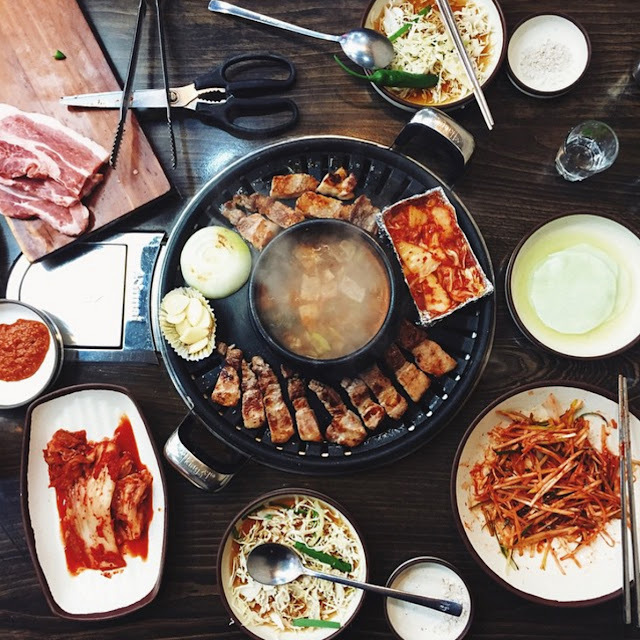 Both the locals and foreigners can be seen dining at these places as well- samgyupsal (pork belly) serving starts from 2 pax...so if you are planning to go alone, be prepared to order at least 2 servings or sadly be asked to leave. Let's watch the paint dry together now, shall we? 1. Tamra-don/탐라돈 홍대본점 in Hongdae- I don't know why I didn't blog about this place (oh yes, this was the start when this blog wasn't filled with food documentations) but if you are looking for "black pork" like the ones famous in Jeju, you should drop by this place! Interior is fairly simple but the tasteeeeeee!! BEST! This is the only picture I manage to dig up far down my instagram feed. 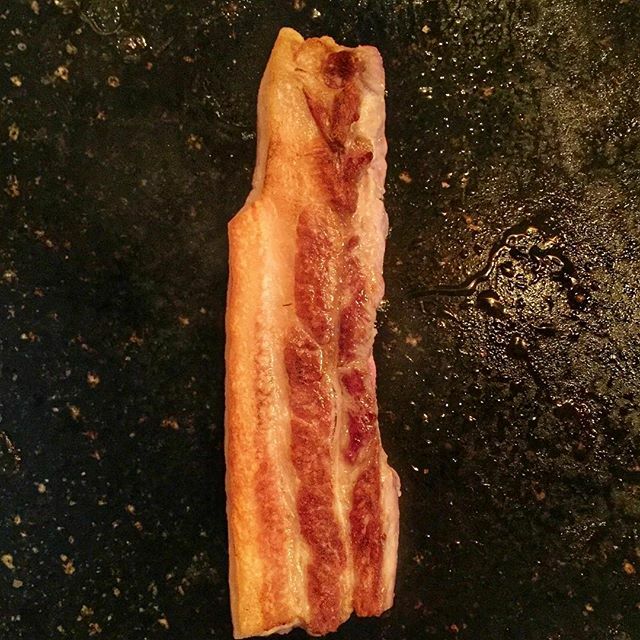 If you are serious about pork belly, you should try this place! I found a website with a map and good directions here if you intend to try it out! 2. 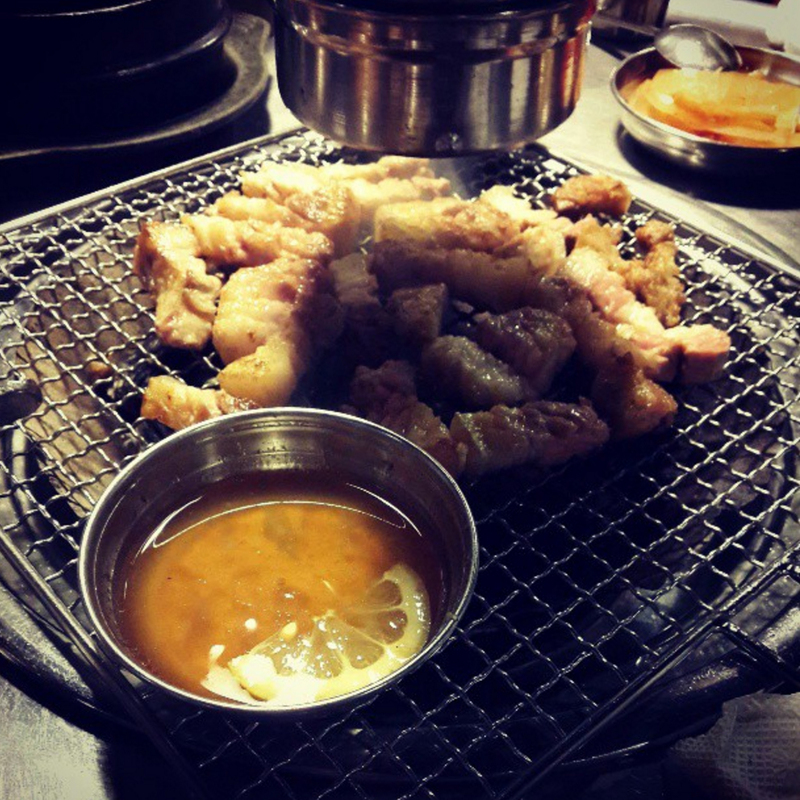 Hwa Tong Sam (화통삼) - this is a BBQ chain and there are outlets at almost every hot spots in town. (Click here to see the original blog post on it). 3. 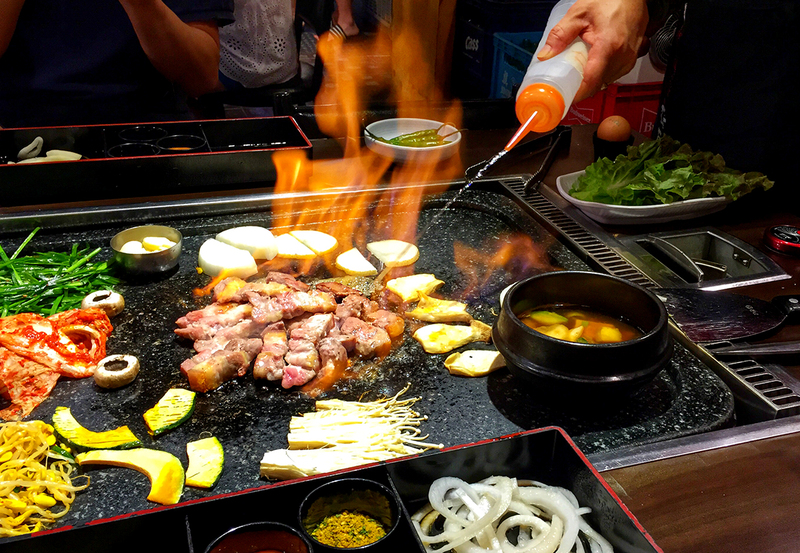 Hanam Pig (하남돼지집) - this is another BBQ chain and they will cook ENTIRELY for you and it there are many outlets at almost every hot spots in town as well! 4. 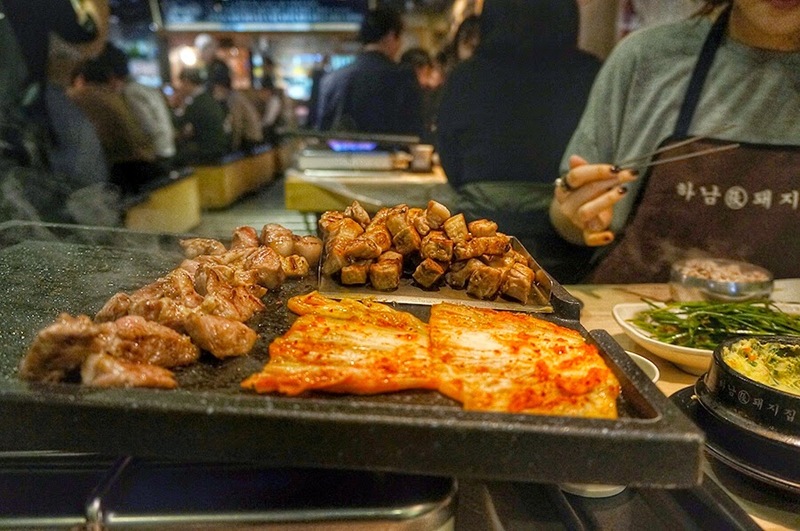 3geori Butchers (삼거리푸줏간)- opened by YG, this is BBQ joint is situated in Hongdae and they cook it halfway for you and will drop by to check once in awhile to see if you are doing ok. K-pop fans can be seen here as well as local korean family. 5. Hapjeong-don (합정돈)- a fairly new joint that popped up near our office and it is run by a mother+son team, their dipping sauce is the star! A pretty new concept- looks like some high tech camping bbq pit- love how the oil from the meat drips down to the space were you bbq your kimchis (watch the video below and you'll get what I mean). I haven't had the chance to blog about them but here below are some visuals from my last visit there. It is situated around the housing area inside of Hapjeong-dong. Here's the address: 47, Huiujeong-ro, Mapo-gu, Seoul / 서울 마포구 희우정로 47. BONUS : At Home or any roadside stall you come across with a waiting line or a full house. Here below is a picture of a typical roadside bbq joint that i've dined at - the basic soup, sauce and kimchi are fixed like an untold package. Prices can be around 20% cheaper than the 4 joints I wrote above. Then again, is not where you eat, but who you eat it with. So, tonight...as i'm typing, John has the pork belly in the oven and i'll be opening a bottle of red to celebrate SAM SAM DAY with the rest of the meat-arians of the world. DIY - Reupholster Piano Chair.